Welcome to Staybridge Suites in Exciting Reno, Nevada Located near the Reno-Tahoe International Airport, MHI Global, Employers Insurance, Renown Hospital, Intuit, Microsoft Licensing and GTech (IGT), our extended stay hotel in Reno, Nevada offers a convenient location and allows guests to experience all the comforts of home during their long term stay. Visitors to our upscale accommodations near downtown Reno can enjoy shopping at the nearby Summit Sierra Mall or visiting one of the area's most exciting casinos. Just a short distance away, Wild Island Water Park and beautiful Lake Tahoe provide fun for the entire family. 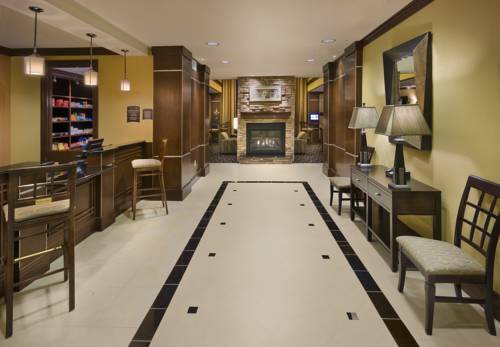 Business travelers appreciate our hotel's location near the Reno - Sparks Convention Center and the Reno - Tahoe Tech Center, as well as companies such as Abaris and Microsoft. Our upscale Reno, NV accommodations also provide a flexible, 304 square foot boardroom, perfect for on-site meetings. While lodging in Reno,we hope you will take advantage of our complimentary laundry services. Other choice amenities include a 24-hr business center, fitness center, indoor pool and whirlpool, outdoor grilling area and library. In the morning, enjoy a cup of Wolfgang Puck coffee served at our free breakfast buffet, and in the evening, join us in our community Great Room for beverages and hors d' oeuvre. As you plan your visit, we invite you to explore our excellent Reno, NV extended stay hotel rates and book your rooms today. Summit Sierra MallOutdoor mall with great shops, movie theater and restaurants including BJ's Brewhouse, Johnny Carino's, GAP, Old Navy, Ann Taylor, Apple, and many more! Located just a short 5 min drive from hotel. Meadowood MallIndoor mall located just a short drive from the Staybridge Suites reno. Has large amount of stores including Sears, Macy's, JC Penny , a food court and many more! Downtown CasinosDowntown Reno casinos have everything you could possibly want. Exciting nightlife, the greatest shows and concerts, gaming and world class cusine. All located together, downtown is your one stop to all the action! University Nevada RenoWith over 145 degree programs, Nevada is bound to have a starting point to career goals. From expertise in earth sciences to demonstrated success in journalism, Nevada degrees open the door to unexpected opportunities.